Ranging from ...: Rhino Notching! There were still dew crystals scattered on the long blades on grass and the fresh winter chill was keeping us awake, when we headed off early one morning on what we thought was a regular morning drive. I had a small group of people with me who all got along famously and I was thoroughly enjoying their company - our drives were filled with laughter! After about an hour of driving and not seeing anything too exciting, my radio came alive and my call sign was called. I responded and the reserve manager Dale wanted to know where I was and if my guests would like to join them in darting a rhino. How very exciting! I tried to keep my cool as much as possible as I nonchalantly relayed the message to my guests. Well, my vehicle came alive and everyone suddenly woke up. I warned my guests to hang on as I reached the speed limit of 40km an hour on the bumpy dusty road. We needed to meet the team before any of the action started and as we weren't quite sure when that would be, we needed to put foot. 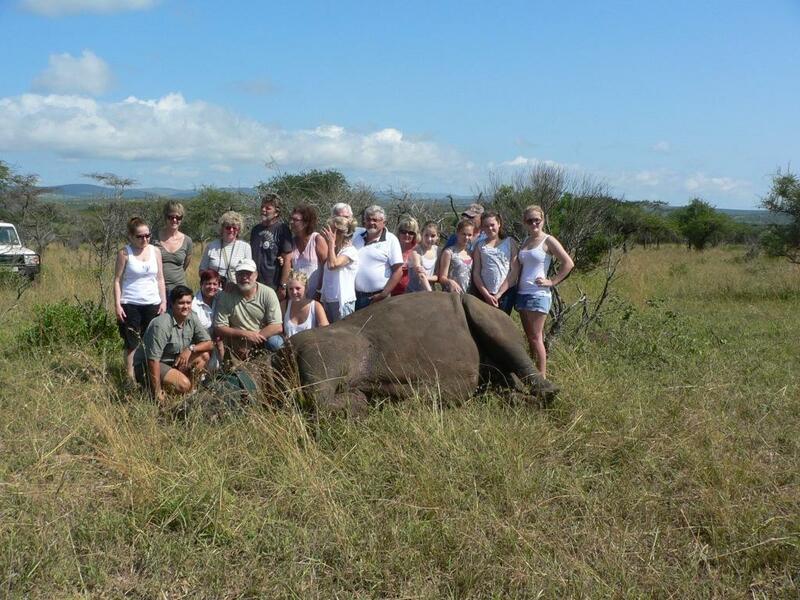 We found the darting team and another lodge from the Zululand Rhino Reserve who had also bought their guests along for the experience. The excitement was palpable and everyone got chatting and the reserve ecologist briefed us all on what would be happening and why. 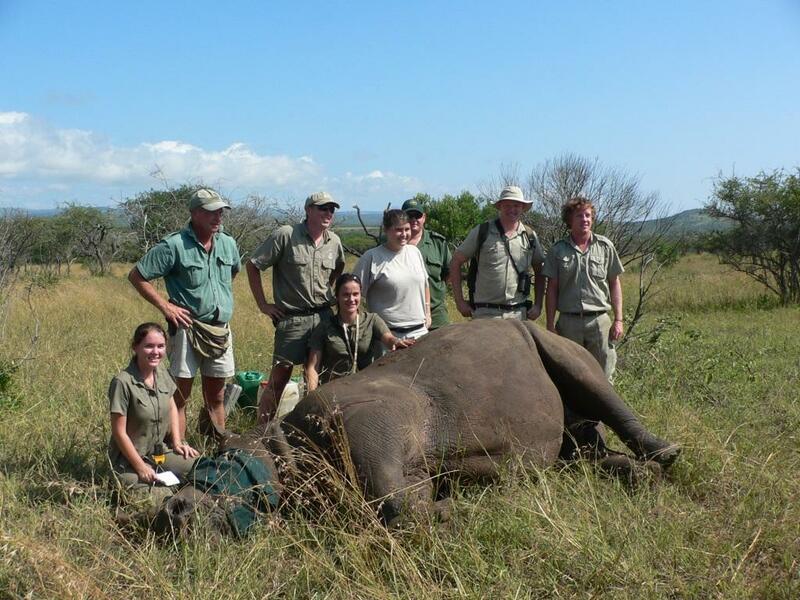 As part of rhino conservation, nearly all rhinos in Kwa-Zulu Natal and even South Africa are notched. Notching is a way of identifying each individual animal. A small triangle of skin is removed from the rhinos ears and depending on where the notch is removed from it has a corresponding numerical value. So each animal is given a numerical "name". The skin that is removed is also used for genetic analysis in order to monitor breeding. Along with the notching, the animal has a microchip inserted into its horn where a drill is used to create a little hole that is later filled up again, and another one inserted under its skin with a simple injection. This is completely noninvasive and the animal cannot feel it at all as their horns are made up of similar proteins as our finger nails and hair. These microchips correspond with each other so that if we come across the horn we can relate it to the animal and the reserve it came from. 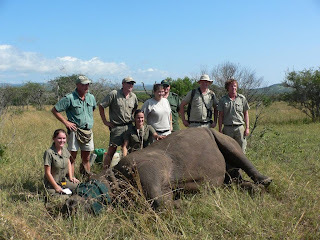 With poaching being so rife, it is so important that we keep tabs on all our rhinos. Both black rhino and white rhino. This method id the best way forward and the entire process takes less than 15 minutes. After enjoying a hot cup of coffee and a good chat while waiting to get news on the rhino, we got the message that it had been darted and we needed to move in fast! Off we went crashing through the trees so that we could get there in time to watch the animal go down. It had been darted from another vehicle by the vet and now we were off to join them. 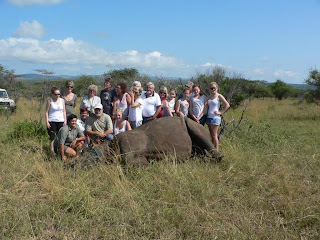 The rhino went down in a nice open space and we all circled around to watch the process taking place. Someone was asked to volunteer to remove some ticks for scientific research and not many hands came up for that one! After getting up close and personal, seeing smelling and touching her, we took photos for our guests and then loaded back into the vehicles to watch her getting woken up with the reversal drug. This is always the scariest part as we're not sure what mood they're going to be in. Quite often a little grumpy! After ensuring everyone was at a safe distance the reversal drug was administered and the big animal got up a little drunkenly. Off she tottered back to her companion who had been waiting not too far off. What a great and exciting morning! 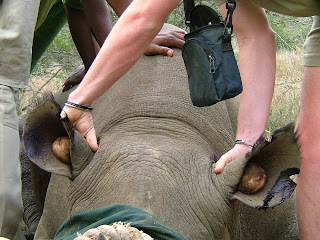 It's always great to be able to give our guests a hands on experience as to why rhino conservation is so important, and being a part of the process that will hopefully drive the message home.